I don’t know exactly how we ended up with both our children in the military. And both pilots no less. Neither Don or I had ever been in the military. And in fact, other than one older cousin who was drafted during the Vietnam War, I really didn’t even know anyone from my generation who had served. Of course, my father and his two brothers and all of my Mom’s brothers enlisted in various branches of the US military during World War II. But that was a very different time when the world rallied together to defend democracy against tyranny and rise of dictatorships in Germany, Japan and Italy. Those who survived, were welcomed home as heroes, and their return sparked one of the greatest periods of economic growth this country has ever seen. My son was always an excellent student and a voracious reader. He was on the quiet side, preferring a small circle of close friends over being just one of the crowd. I suppose there were clues about his future career choice that I didn’t take seriously. Like when he was asked to explain Pearl Harbor Day to his fourth grade class or when he wrote his fifth grade research paper describing his future with the Coast Guard. But that was elementary school. When he graduated high school as one of the valedictorians, he was offered several college scholarships. His commitment to the Coast Guard Academy in New London, CT. was made just a couple of months after 9/11. I have to admit that I was happy that he had chosen to serve his country in a capacity that was focused on saving lives rather than fighting wars. That would soon change when in the spring of his freshman year, President Bush signed legislation making the Coast Guard part of the Department of Homeland Security and giving it a stronger military role. It spite of some initial misgivings, he elected to stay and is currently assigned to an Air Station in California where he flies helicopters. My daughter was a good student as well, though she preferred almost any sport to being inside reading. She was very outgoing and had lots of friends, many of them boys.I really can’t say when she started to seriously think about going the military option for college. She likely was influenced by her older brother’s experience. She saw that his scholarship would not only pay all his college expenses, but that he had the opportunity to do some pretty exciting things like summer “cruises” aboard all types of boats, travel, and of course, a guaranteed job upon graduation. 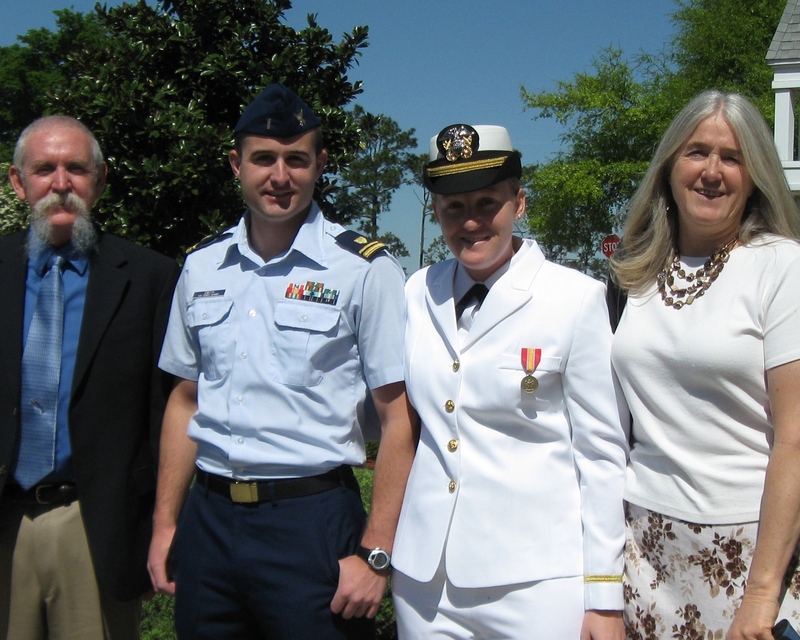 She received a Naval ROTC Scholarship. She ended up flying as well and is currently assigned as a flight instructor in Florida after spending three years forward deployed in Japan. This entry was tagged Coast Guard, Freedom, Liberty, Navy ROTC, Veterans, World War II Veterans. Bookmark the permalink.